Acute respiratory distress syndrome (ARDS) is a form of acute lung injury, which is characterised by severe hypoxemia in the absence of a cardiogenic cause. It occurs when there is inflammatory damage to the alveoli, which leads to pulmonary oedema, respiratory compromise, and ultimately acute respiratory failure. The degree of ARDS severity can be further defined, based on degree of hypoxemia via the PaO2:FiO2 ratio: Mild = 200-300mmHg, Moderate = 100-200mmHg, Severe ≤100mmHg. The pathophysiology is complex, and poorly understood. It is thought that direct injury or activation of the systemic inflammatory cascade results in breakdown of the alveolar-capillary barrier. Consequently, its permeability increases, and this leads to fluid infiltration and pulmonary oedema. The fluid infiltration impairs ventilation and gas exchange, leading to hypoxaemia. In addition, damage to the type II alveolar cells impairs surfactant production, reducing the lung compliance and further worsening ventilation. ARDS is self-perpetuating. The affected alveoli begin to expand more and more, with the shear forces from this expansion resulting in barotrauma and more cell damage. Acute respiratory distress syndrome presents with (worsening) dyspnoea, usually in the presence of a related risk factor or underlying cause. This then rapidly leads to hypoxia, tachycardia, and tachypneoa, with inspiratory crackles on auscultation. Classically shows diffuse bilateral infiltrates, similar to that of pulmonary oedema. 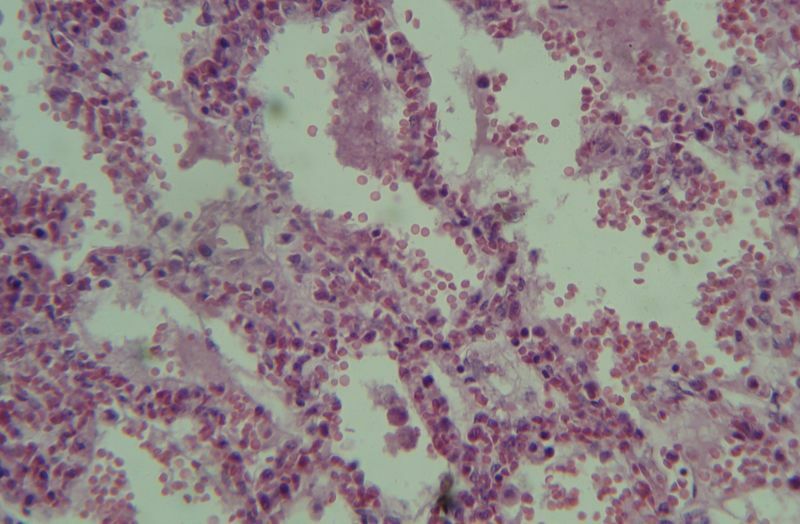 The suspected underlying cause of the acute respiratory distress syndrome will determine which further investigations are required. The management of acute respiratory distress syndrome is twofold; (i) supportive treatment with ventilation, and; (ii) focused treatment of the underlying cause. It is highly likely that patients will require emergency intubation and ITU admission for respiratory and circulatory support. Pharmacological treatments of ARDS have in the past involved the use of artificial surfactant and corticosteroids, however are used less and less in modern practice. Use of artificial surfactant can be effective in neonatal cases, however has yielded no advantage in adults, whilst the use of corticosteroids are not effective in the acute phase of ARDS (but may reduce ventilation days when used 7-14 days after onset). Acute respiratory distress syndrome remains associated with a high mortality (~40% in Western centres), although it varies dependent on the underlying cause, age and degree of multi organ failure. Survivors can develop pulmonary fibrosis, although in many patients, lung capacity returns to normal within 12 months. Only 50% of patients will return to work after one year. Which of the following is a 'direct' cause of acute respiratory distress syndrome? What is a feature of acute respiratory distress syndrome on examination? Which of the following pathologies has similar x-ray features to acute respiratory distress syndrome?